You tell Populi to generate a charge when certain conditions are met. You do this by setting up Tuition Schedules, Fees, Room/Meal Plans, etc. A student enrolls in a course for next Fall, meeting those conditions. Populi, in response, generates pending charges. You might also manually-add a charge, which first becomes a pending charge. Pending charges, as long as they're still pending, can be modified and even deleted. When charges are pending, this is the time to review them for accuracy, completeness, etc. After your review is finished, you're probably ready to invoice those charges. When you include a charge on an invoice, it can no longer be modified. Invoices must end up in one of three conditions: Paid, Void, or Marked Uncollectible. Invoices are marked Paid when you've applied payments or credits sufficient to cover the invoiced amount. Payments include regular payments (cash, check, credit card, etc.) and Financial Aid; you can also apply credits (a transaction which indicates that you owe the student money) to invoices. Invoices are marked Void to remove their effect on the student's balance. Voiding an invoice is only necessary when you make a mistake. If you void an invoice, you'll need to re-add those charges to the student's account, whether manually or by re-triggering them. Invoices can be marked uncollectible if you've determined the invoice will never be paid owing to delinquency. In a few words: Pending charges can be reviewed, modified, deleted, or invoiced. Invoices are then either paid, voided, or marked uncollectible. Invoices are composed of charges, each of which describes a product or service that's being exchanged for money. Charges, in Populi, refer to money owed by the student to the college. Whenever Populi detects an event that should lead to billing changes (e.g. a student adds/drops a class, misses a payment plan deadline, etc. ), it adds a pending charge to the student's account. This lets you look over and confirm the charge before it's invoiced and becomes official. Pending charges can be edited or deleted, but once you invoice a charge, it is set in stone, as it were: it is now a permanent part of the audit trail. If you invoice a charge by mistake, you can negate its effect on a student's balance by voiding the invoice (more below) or issuing a credit to reverse that charge. All pending charges can be found in the eponymous report in Financial > Billing. All of a term's charges can be found in Financial > Billing > By Term > Charges. To see an individual student's charges, go to her Profile > Financial > Dashboard or By Term view. Credits are negative charges. They're added just like any other charge, except that they have a negative amount. They're also generated by refund policies. Credits can be invoiced and will reduce the amount the student needs to pay on that invoice. In case the amount of credits is greater than the amount of charges on an invoice, that invoice becomes a credit. Instead of an "Invoice #", credits have a unique "Credit #". Credits and invoices have two different sequences; you could issue two invoices numbered #5087 & #5088, and then a minute later issue two credits numbered #404 & #405. After issuing a credit, it may behave one of two ways depending on what you've selected for the Manually distribute unapplied payments and credits setting in Financial > Settings. If you select No, then credits will be automatically applied to any outstanding invoiced charges on the student's account. If there are no charges, it will become an unapplied credit. If you select Yes, every credit you issue will become an unapplied credit which you will then have to manually apply to invoiced charges. Unapplied credits can also be refunded to the student using the Refund Credit Balance workflow. Click invoice pending in Financial > Billing > Pending Charges. This lets you invoice charges en masse. 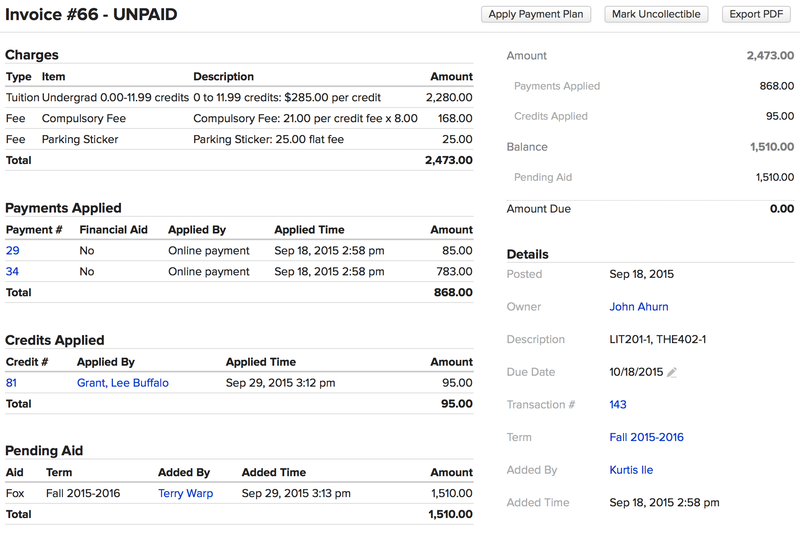 Click invoice pending on a student's Profile > Financial > Dashboard or By Term screen. This lets you invoice an individual student. Read more about how to invoice charges. The invoice page gives you all the details: the charges, any payments or credits that have been applied to the invoice, pending aid expected to apply to it, and a breakdown detailing the amount due. If there's a payment plan applied to this invoice, you'll see that also (see below). Click the Transaction # or payment detail to view the particulars of any payments made on the invoice. If you need to void the invoice, click Void on the transaction page. Edit the due date by clicking , adjusting the date, and clicking Save. Click Export PDF to create a PDF of the invoice. The invoice will not have any payment information. You can also apply a payment plan and mark the invoice uncollectible. See below. Before you apply a Payment Plan to an Invoice, make sure you don't want to apply it to the Student (which automatically calculates a Plan's optional items like cost, late fee, and min. amount). Applying a Payment Plan directly to an Invoice bypasses its optional items and simply spreads the invoice amount over the Plan's number of Payments. Select from the available payment plans. You'll see a new Payment Plan panel on the invoice page. Click edit in that panel to change or delete any part of the payment plan schedule. Click Edit Payment Plan to change or remove the plan you selected earlier. If the invoice owner is delinquent on paying the invoice, you can mark it uncollectible. Doing so credits accounts receivable and debits an expense account used to record bad debt. Before marking invoices uncollectible, make sure you have an expense account for this purpose on your Chart of Accounts. Select the appropriate expense account. A Sales Credit is then issued to the student for the invoiced amount and will be automatically applied to that invoice. If you later mark the invoice collectible, a new transaction will be created for the previously-uncollectible amount. Nearly all of the students at the school where I work are on a payment plan. Is there a way to batch payment plans, or do I need to go into each student's record and apply a payment plan? I suspect this is not possible given that a payment plan is attached to a specific invoice.